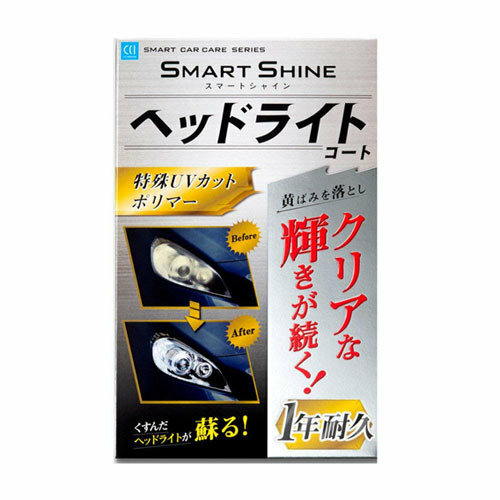 Easily removes the yellowing and dullness of the headlight and restore the brightness of the light.The main cause of yellowing headlights is ultraviolet rays. Because special UV-cut polymer is compounded, transparency will be maintained by preventing yellowing due to ultraviolet light even after use.Effect least up to 1 year! After polishing the headlight with the attached sandpaper to remove yellow tints, it is completed with an easy task of simply applying the liquid with the attached sponge. (1) Do not use at temperatures below 5 ° C.
(2) Please do not use in dusty place, hot weather, rainy place and head light hot. (3) Do not use for vehicles with headlight washer, headlight wiper. 1. Please wash the parts to be used and wipe off moisture. 2. To prevent scratching the body of the car during polishing, apply a masking tape to the outer periphery of the headlight. 3. (1) Rough polishing: Wrap the backside ocher-colored polishing paper around the polishing pad and polish while wetting the headlight with water. ※ Please polish until yellowish spots disappear and the whole becomes white. ※ Headlight will be white and cloudy, please continue working. (2) Finish polishing: Wrap the back side white polishing paper around the polishing pad and polish while wetting with water. ※ Use polishing paper for polishing finish for left and right headlights with 1 piece. ※ Although the headlight is white and cloudy even after finish polishing, it becomes clean and transparent state due to work of coating agent (7 ~ 8). 4. Wash the headlight clean with water, wipe the moisture with a towel and dry it. ※ If there is yellowing or polishing unevenness, please repeat the 3 (polishing) process. 5. (1) Remove solution A from the bag. (2) Turn the cap on the injector tip of liquid A to remove it. ※ Please be careful not to jump out the liquid inside. (3) Inject liquid A into the container of liquid B. ※ Please put in slowly so that the liquid does not spill. ※ The empty A liquid injector will be used in the next process. (4) Lid the container of liquid B and shake it 5 times or more to make a mixed liquid. ※ Please use the mixture within 6 hours. 6. Take 2 ml of the mixed solution in the empty injector of Solution A and let the solution penetrate the gauze face of the applicator. ※ Use one applicator for each of the left and right headlights. 7. Lightly hold the applicator and quickly paint the entire headlight from the top of the headlight so that it does not drip (approximate time 40 to 60 seconds). ※ Please correct the paint streaks on an approximate time. ※ When foam occurs, please push it out of the headlight with an applicator. ※ If the temperature is high, drying will be faster so please work quickly. ※ If liquid adheres to the head light, please wipe immediately with a wet towel that has been squeezed hard. 8. After drying for about 3 minutes, repeat 6 to 7 once more (dry at a temperature of 10 ° C or lower for about 10 minutes). 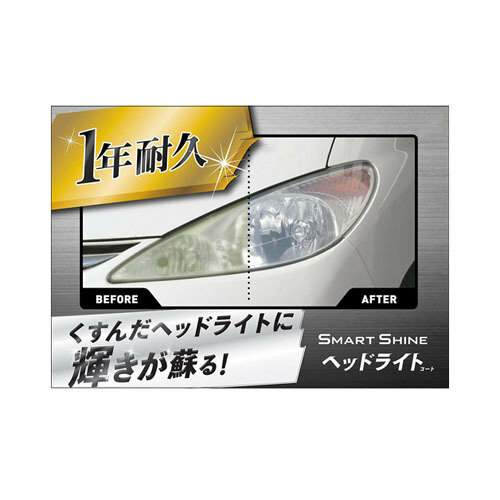 ※ Reduce the mixed solution to 1.5 ml with a small headlight (about 20 × 20 cm or less) by overcoating. 9. (1) Naturally dry for 30 minutes or more after coating. (2) peel off the masking tape and complete it. ※ Please refrain from car wash for 1 week after construction.